ABA is proud to have been, and continues to be associated with the development of Lydd airport. 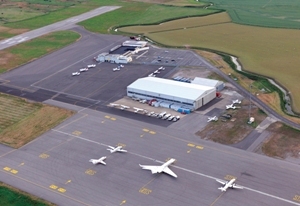 Purchased by ABA in 1996, Lydd was turned around leading to a successful investment in 2001. The shareholding was reduced in 2005 and ABA is now a partner and advises the airport. With proven hands-on experience, ABA offers expertise in a number of critical areas of airport development and management (see diagram below). Synergies between each of these activities and ABA's interest not only provides economic resilience but also means that every consultant is a practicing aviation manager. Specific individual skill sets and years of specialised industry experience are used to bring clients real-world solutions in an ever challenging environment. Runway and taxiway requirements, capital expenditures and financial projections, terminal and facility planning, political lobbying, and virtually every other aspects of airport development - ABA consultants are able to advise on either individual projects, or draw up a full feasibility study, coordinate a master plan and manage an entire development. Determining factors to assess full market potential: drive time profiles, demographics, market segmentation, infrastructure, airport capacity constraints, inbound and outbound markets, and competition. Dominant factor in most projects - the ecological impacts of any proposed development must be firmly grasped. In consultation with all stakeholders and the planning authority, ABA is able to coordinate with the environmental experts to conduct scoping reports leading to an Environmental Impact Assessment (EIA). Traffic flows, airspace classification and airway integration impact an airport's acceptability within the wider air traffic environment. Airport ATC and navigation facility installations represent a significant portion of the fixed cost in the start up or development phase. Defining the right level of service and correctly assessing the timetable is therefore essential. ABA consultants can advise on the correct equipping and categorisation of required airport and Fire and Rescue Services. Consultants also have hands on experience in setting up airport security systems. An airport is either unlicensed (private) or licensed. An unlicensed airport will typically have a grass or short runway and cater for private aircraft keeping costs down. A licensed airport is regulated by the appropriate aviation authority for its country of location. The regulatory authority will only allow operations of aircraft provided the airport can demonstrate its capability to safely cater for and control those operations. The larger and busier the airport, the larger and more capable the facilities must be. Becoming compliant or upgrading - in order to gain or upgrade a license, an airport must analyse its optimum traffic types and set its stall accordingly. until break-even activitiy levels are reached, the provision of unnecessary over-capability is very costly. Equally under-provision will present a barrier-to-entry for potential and important airline custom. Assuring continued compliance - heavy emphasis is now placed upon the airport operator to have internal systems which ensure continued compliance. When the regulatory authority conduct compliance audits they will be focussing on these internal systems in order to check they are robust and picking up and rectifying non-compliance issues. Quality Management System - critical to maintaining compliance. This involves internal audit process and closed loop feed-back to analyse the root cause of non-compliances and ensure no repeats. Airports are required to establish a Safety Management System (SMS). The authority needs to be satisfied that the SMS will play its essential part in focusing organisational resource towards a safe operation. Risks and hazards must be thouroughly analysed and measures put in place to minimise any accident or incident. Safety needs to be a culture from top down.